Inspired by Rihanna but with my personal touch! When it comes to fashion, Rihanna has always been one on my favorites! According to me her style is fierce, sassy & eccentric. And with Rihanna now also being the Creative Director of PUMA has unveiled a collection that is true to her aesthetics - Fearless & Edgy. So, when Popxo got in touch with me to create a look featuring the latest PUMA collection, I was more than ecstatic. Puma in association Myntra has come up with the contest where in the winners would get a chance to MEET SUPERSTAR RIHANNA IN USA! How cool is that. When talking about jogger pants most of us think of it as just a workout gear. But believe it or not, they can look really fashionable if worn right! So when, for this look, I picked up these PUMA joggers from Myntra, I decided to style these unconventionally! 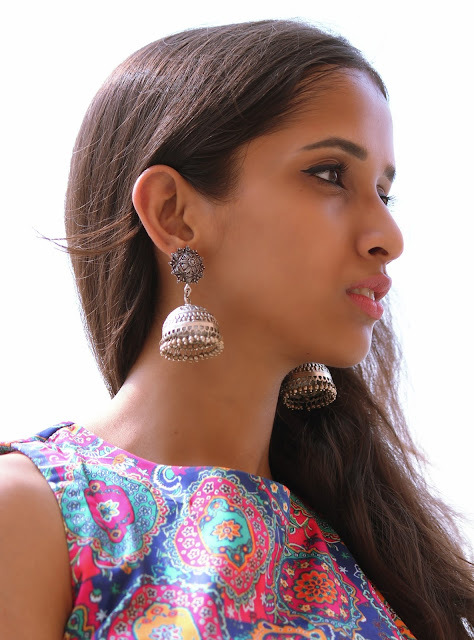 These jhumkis have been my fav accessory so far, these summers! I have lost the count of the no. of times I have paired these with my outfits be it with ethnic or even western, to the least. If you're a jewelry lover like me I would really suggest you to add a pair of these silver beauties to your jewelry box. While mine is a thrift shop pick, I have shortlisted few of my other favorites. The title clearly explains that in today's post I will be talking about my love for versatile fashion. Being a smart shopper I always prefer investing in pieces which can be styled in various distinct ways. That means no more fear of repeating outfits without burning a hole in ze pockets! 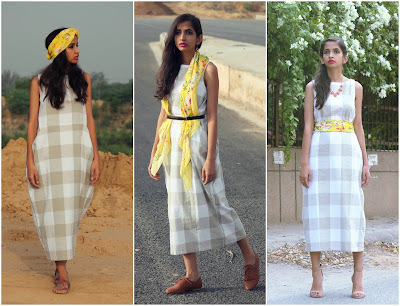 For this post I picked this easy & effortless midi dress by Bhane. What caught my eyes were the huge pockets & chic loose fit! And during the check out process I already had three ideas of styling this dress in my head. I decided to use the same scarf in the all the three looks because well, we are talking about versatility, aren't we? For the first look, I opted for a melange of modern & traditional wherein I used my scarf as a headwrap and paired the dress with kolhapuri slippers. A sleek anklet & a septum ring perfectly complimented the over all look. These days with the harsh sun and humid weather around, I am following the 'less is more' motto for summer dressing. Talking about minimalist style, it is not just effortless but also comfortable to survive these hot months of the year! The relaxed aesthetics, amalgamation of élan & ease & clean lines makes it a perfect choice if you want to follow a back-to-basics approach while looking stylish at the same time! The ideal way to sport minimalist style is to choose one statement piece & let it pop against something basic. Classic, elegant & simple!